An original storyboard used in the production of the 1980 science fiction picture The Empire Strikes Back, the second instalment of the classic Star Wars franchise directed by Irvin Kershner. 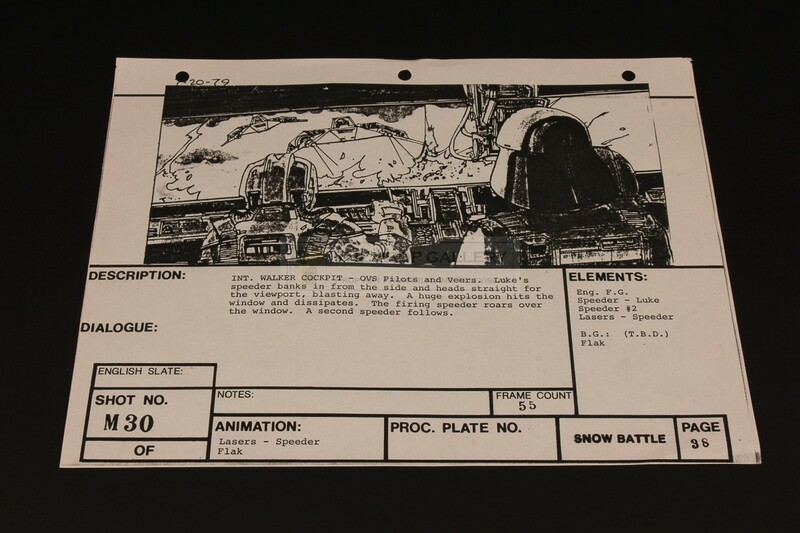 This storyboard is a production issued copy of the original rendering created by assistant visual effects art director Nilo Rodis-Jamero and depicts the view from inside the walker cockpit from the now iconic battle of Hoth sequence. The storyboard was issued to Brian Johnson, part of the team which went on to win a Special Achievement Academy Award for the visual effects on this picture, and utilised at Industrial Light & Magic during the production of the visual effects shots. The board features various details relating to the shot including the effects elements required and animation notes with a detailed description of the shot underneath the illustration. 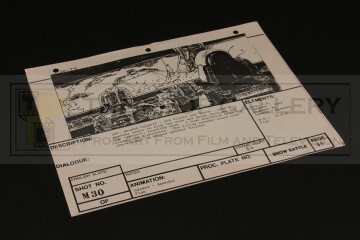 The storyboard carries the date 7.20.79 and was later replaced by an updated version with the omitted boards intended to be destroyed however this rare example was retained by Brian Johnson and hails from his private collection. The storyboard measures 8.5" x 11" and remains in near perfect condition with three punch holes for binder use, very fine. A fine example of an original storyboard with excellent subject matter from one of the most influential and highly regarded franchises in cinematic history.